I am always amazed where the imaginations of children will take them when they aren't staring at a screen. LOL. Hey, can you blame them? That looks like fun. I love the one in his bike helmet! Looks like a good time and nothing better than playing together with their imaginations. This is hilarious! And the bike helmet makes it even funnier. This is so funny! Made me smile. :-) I bet they had a good time. It looks like they were using their imaginations which is a GREAT thing! So cute! That's funny. I love their creativity. We used to have an old wheelbarrow that we'd cart each other around in. Someone always got shafted on their turn as everyone got tired. I hope everyone got a turn on the stretcher. Aww, someday they will treasure this picture. Glad to see at least one of them is wearing a helmet! lol! I love this! I see one of them "geared up" with a helmet. Good imaginations. They have the best imaginations....too darn funny! 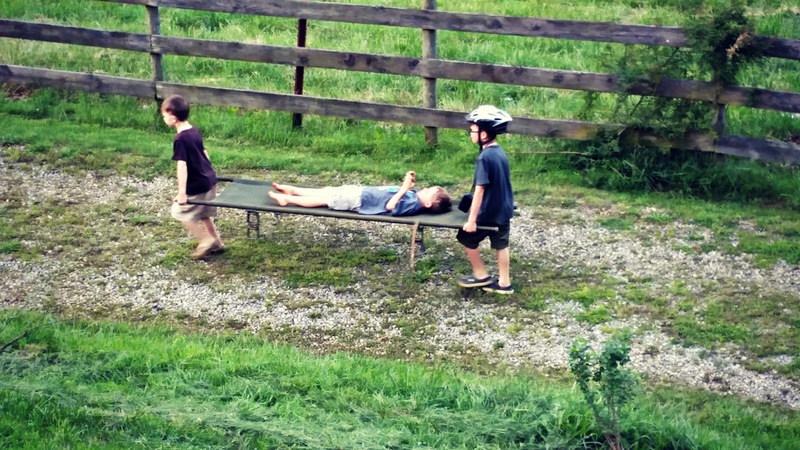 Boys always find something to do. Love their imaginations.